Geoweb® geocells are excellent tools for erosion control. The Geoweb system can be placed on a slope or in a channel and then infilled with a variety of erosion protection fills, such as topsoil, gravel, crushed rock, or even concrete. The 3-dimensional Geoweb structure holds the upper soil layer in place on the slope and prevents washout from water action or other erosive forces. In sandy soils, subject to wind erosion, the Geoweb system helps retain soils until vegetation has a chance to establish itself. On steeper slopes, the Geoweb system can help to hold embankment soils in place. 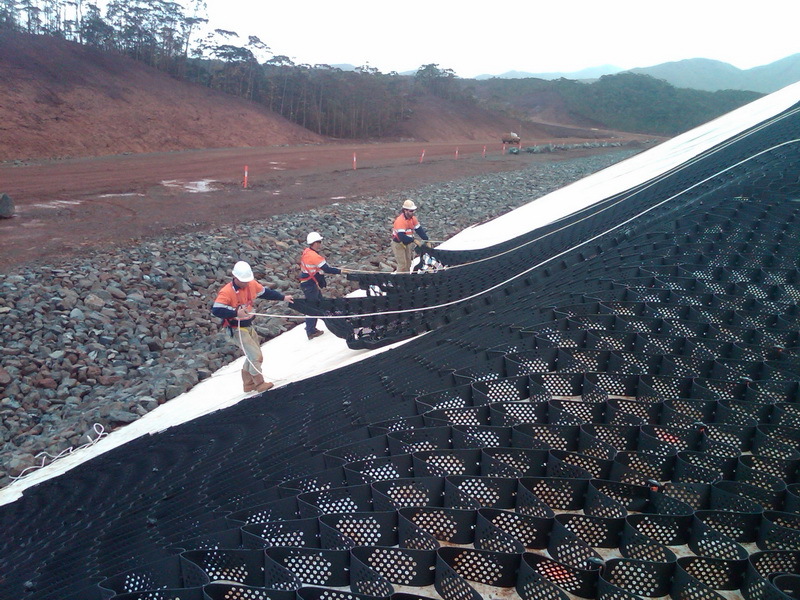 The system is an excellent cover for geomembrane liners on slopes. Optional accessories available with the Geoweb system include, tendons for anchorage at the crest and over liners, ATRA® anchors for staking the Geoweb on slopes, ATRA® Keys to connect Geoweb sections together and erosion blankets (for vegetated solutions). Project specific evaluations are available for product recommendation and design.